Can you confirm these amateur observations of Abronia deppii? Type locality: Mexico. Restricted to Omilteme, Guerrero, by SMITH & TAYLOR 1950, later restricted to Temascaltepec-Real de Arriba, in the State of Mexico, by SÁNCHEZ-HERRERA & LÓPEZ-FORMENT 1980. Comment Distribution: Map in Bogert and Porter 1967: 16. 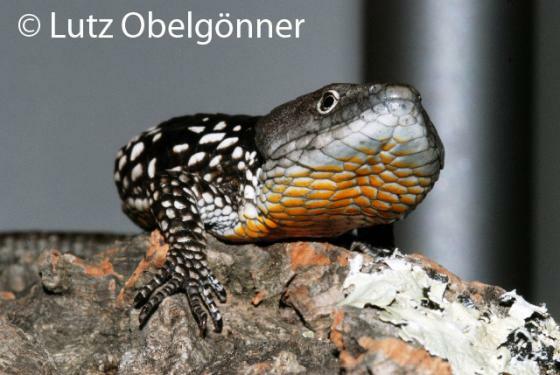 Has been confused with what is now called Abronia martindelcampoi FLORES-VILLELA & SÁNCHEZ-HERRERA 2003 who also redescribed A. deppii. Hence not in the Sierra Madre del Sur, as reported by FLORES-VILLELA & SÁNCHEZ-HERRERA 2003. Type species: Abronia deppii is the type species of the genus Abronia GRAY 1838. Note that there is also a plant genus of the same name. Etymology The generic name apparently is derived from the Greek word abros meaning "delicate" perhaps in reference to the delicate nature ofthe tail (Lemos-Espinal & Dixon 2013). The species has been named after one of the collectors, Ferdinand Deppe.